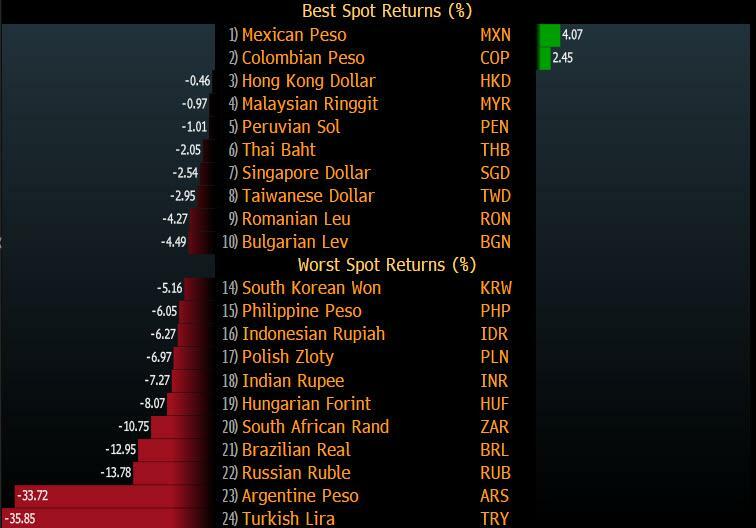 Friday's fall has made the Turkish Lira the worst performing emerging market currency in 2018 and as the currency was headed for its worst week since 2001, its YTD collapse has surpassed even the Argentine Peso. "Seems like a complete crash, so they need to act now,” said a stunned Morten Lund, strategist at Nordea Bank in Copenhagen. “The lira will keep falling if they don’t hike rates today." Then again with Erdogan's stated preference that rates never go up, it is quite possible that nothing happens. The collapse also slammed Turkey’s bond market, sending the yield on 10-year government bonds soaring by 93bps to a new record high of 20.67%. Friday’s fall came after the Financial Times reported that supervisors at the European Central Bank are concerned about exposure of some of Europe's biggest lenders to Turkey, including chiefly BBVA, UniCredit and BNP Paribas. The FT reported that along with the currency’s decline, the ECB's Single Supervisory Mechanism has begun to look more closely at European lenders’ links with Turkey. The moves also came after the US showed no signs of lifting crippling sanctions despite the visit of a Turkish delegation to the US capital. The ECB news hit Turkey like a rock: "The key to any hope of Turkish stability is the ability for banks to roll over syndicated loans -- so far, that’s been absolutely fine,” said Paul McNamara, a money-manager at GAM UK in London. “I think the FT thing about the ECB being worried about Turkey exposures is a huge new factor." Contagion quickly spread as the banks named by the ECB as exposed to Turkey saw their stocks plunge as the shockwave spread around the world: Europe’s banks opened on Friday under pressure. The Euro Stoxx Banks index dropped 0.5% in early trading, with BBVA, UniCredit and BNP Paribas among those drawing most scrutiny. Shares in BBVA, UniCredit and BNP Paribas were all down more than 3% on Friday morning. “We’re likely to see some weakness across the board,” said Kit Juckes, a macro strategist at Société Générale, noting the weight the issue has already imposed on the euro. 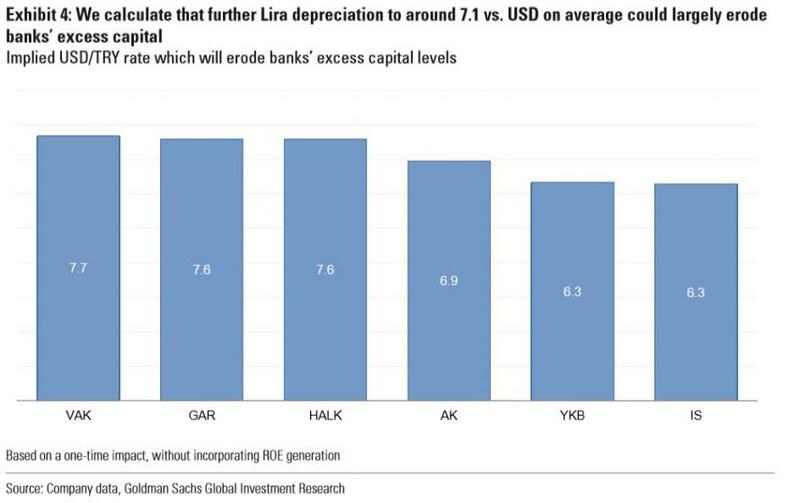 Of course, it will be local bank that go first: as a reminder, earlier this week, Goldman published a research report, according to which a drop in the lira to TL7.1 against the dollar “could largely erode banks’ excess capital”. Renaissance Capital's chief EM economist Charles Robertson said: "The markets have lost confidence in the triumvirate of President Erdogan, his son-in-law as finance minister and the [central bank’s] ability to act as it needs to." 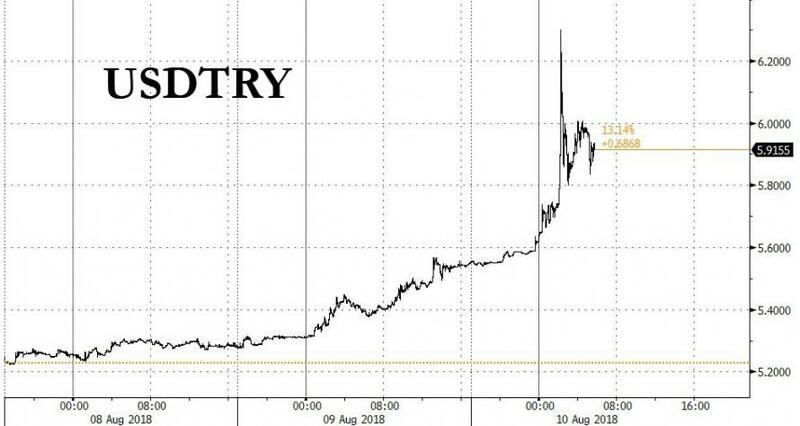 Jane Foley, head of foreign exchange strategy at Rabobank, added that Erdogan’s “defiant” comments on Thursday night “had reduced the markets’ hope” that the Turkish government is willing to tighten monetary policy or begin economic reform. Meanwhile, Turkey continues to pretend that all is well, and on Thursday the Turkish finance ministry said that the banking sector was protected by its robust capital structure and balance sheets. “Contrary to the speculative statements being made in the market about our banks and our companies, our regulatory institutions do not see a problem posed by the exchange rate or liquidity risks." As the FT adds, according to cross-border banking statistics from the Bank for International Settlements, local lenders, including foreign-owned subsidiaries, have dollar claims worth $148bn, up from $36bn in 2006 and euro claims worth $110bn. Spanish banks are owed $83.3bn by Turkish borrowers, French banks are owed $38.4bn and Italian lenders $17bn in a mix of local and foreign currencies. Banks’ Turkish subsidiaries tend to lend in local currency. Carlos Torres Vila, chief executive of BBVA, which owns just under half of Turkey’s Garanti Bank, said last month that the group was “really very, very well prepared for the situation”. He said the bank had reduced the weight of its foreign currency loan portfolio and increased the weight of inflation-linked instruments. Separately, earlier this week, analysts asked UniCredit whether it would need to write down its €2.5bn investment in its 40.9 per cent holding in Turkey’s Yapi Kredi, after the lira’s depreciation dragged the stake’s market value down to €1.15bn. UniCredit responded that Yapi Kredi’s underlying performance was good and the foreign exchange impact would be absorbed by its own reserves. But Goldman analysts said this week that they viewed “Yapi Kredi as the weakest positioned of Turkey’s biggest banks” in terms of capitalisation. BNP Paribas holds 72.5 per cent of retail bank TEB. One person close to the French lender said its exposure to Turkey was “very limited” at close to 2 per cent of overall group commitments. The unprecedented turmoil threatens to scare away the foreign capital Turkey depends on to finance its large external deficit, and hampers companies’ ability to repay foreign-currency loans. Not helping, the government cut its 2018 growth target Thursday to less than 4% from 5.5%, a sign that it is willing to accept a more moderate pace of expansion in an effort to rebalance the economy, Bloomberg reported . There is some hope for damage control: Treasury and Finance Minister Berat Albayrak, the president's son-in-law, is due to hold a press conference this afternoon, although it is unlikely he will announce what analysts believe are the appropriate measures. Today's meltdown took place ahead of a much-anticipated public address by President Recep Tayyip Erdogan. Speaking outside a mosque earlier today, Erdogan told followers “Don’t forget this: if they have got dollars, we have got our people, our right, our Allah." Commenting on Erdogan's statement, Bloomberg macro commentator Stephen Kirkland said that it signals he’s sticking to a nationalist message and uninclined to deliver the hard measures Turkish assets need. 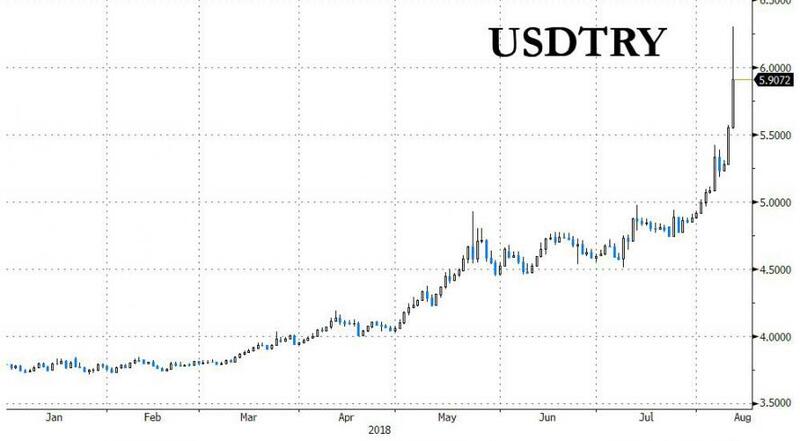 As a result, option markets are now pricing in a one-in-five chance of USD/TRY reaching 7 per dollar in a month, from about 1% probability yesterday, at which point Turkish excess bank capital is wiped out and the currency crisis becomes a full blown financial panic. Meanwhile, three-month USD/TRY risk reversals have shot up to the highest since 2009 and lira forward points have never been this high in Bloomberg data that goes back to December 1996. That market capitulation offers Erdogan an element of surprise to turn things around for the lira. Instead, it’s looking increasingly like it may have much further to fall before he takes the necessary action. As for Turkish Lira longs, Erdogan is right: Allah is indeed all that's left.